Our Consumer Behaviour and Protection team is led by James Suter, who is a Divisional Director at London Economics. James is also a senior member of the Behavioural Economics team. James leads studies with a focus on consumer behaviour and consumer protection. He specialises in the understanding of consumer behaviour, behavioural science, cognitive biases and nudge theory. 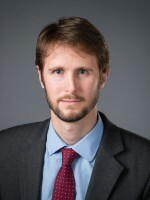 He furthermore has in depth knowledge and extensive practical experience of techniques such as willingness-to-pay analysis, contingent valuation, choice modelling as well as behavioural experiments. He has more than 10 years of consulting experience and has managed and delivered projects for a wide range of high-profile private and public sector clients including numerous UK regulators and the European Commission. He holds both a postgraduate degree in economics and development economics and a joint honours undergraduate degree in mathematics and economics from the University of Nottingham.